Louie is laid-back and carefree compared to Donald's other nephews, but he can see things that others do not. He is the the little duck in green. The three of them take turns running an Item Shop in Traverse Town. They are seen returning to Disney Castle at the end of the game. 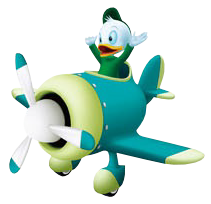 Louie is yet another nephew of Donald's. Out of the three, he is the gentler, more carefree of the bunch. That is not to say he's a hindrance, as he often notices things the others might've missed. Louie is the one wearing green. When the siblings relocated their shop from Traverse Town to Hollow Bastion, Louie got to be in charge of the weapon shop. 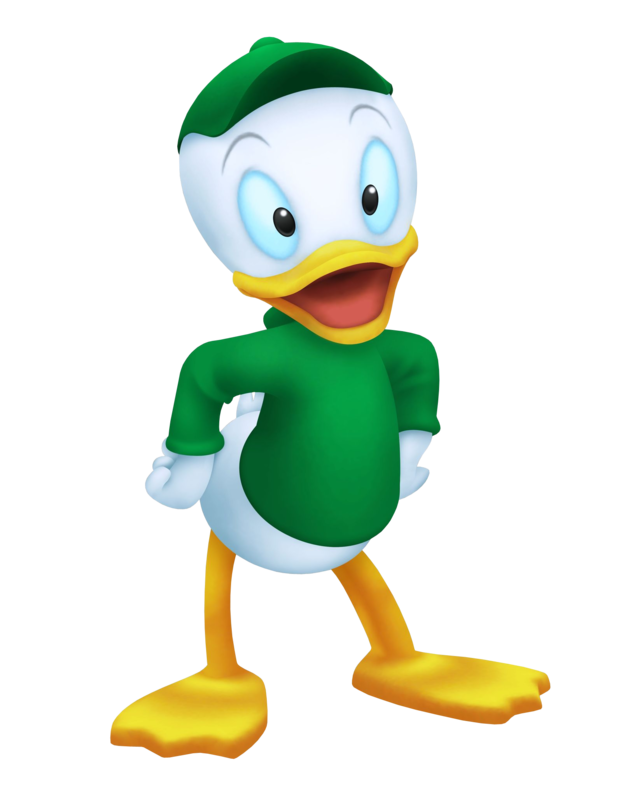 Donald's three nephews, who between them manage the Ice Cream Beat attraction in Disney Town. Huey, the red-clad leader of the trio, had the idea that the three of them should strive to embark upon an adventure, while blue-wearing dewy had the inspiration to combine rhythm and ice cream to raise money, and Louie in green helps out however he is able. When Ventus arrives, they find themselves in a slump when attempting to create new flavours, and enlist his help in the creation of them. When they have successful results, they offer their votes for the Million Dreams Award to Ventus.